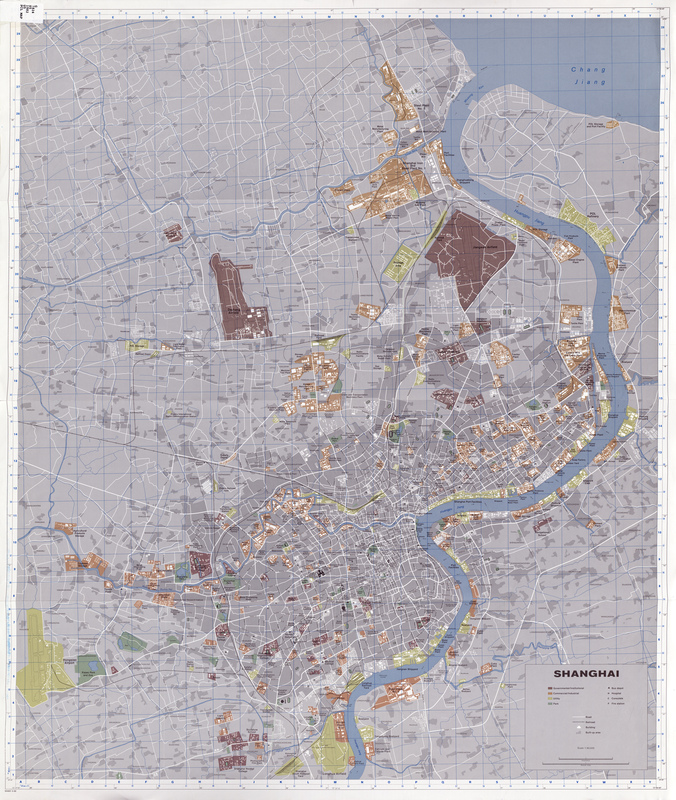 Recently I was looking for some map files of Shanghai for a cartography project when I came across some now-public early 1980’s CIA maps of Asia. The most interesting map I found was a very large 1:30,000 street map of the city. Every nook and cranny from 30 years ago was still there. This is a perfect complement to the maps and images of Shanghai we see today. By the early 1980s, China’s opening up to the world was in full swing. Infrastructure and manufacturing were just kicking into gear. Most of the policies after opening up were just starting to come to fruition. Looking at the map you’ll notice that it labels nearly every factory, hotel (there weren’t many then) and institution of learning. The districts that encompass the former French Concession (Luwan, Changning and Xuhui) look pretty similar to day, save for a few factories and academies. The exponential growth of Shanghai’s famed Pudong skyline has consistently interested people around the world. A few years ago, photos of Pudong in 1990 compared to 2010 made the rounds of the Internet. Breathtaking, isn’t it? However, looking at the map gives some insight at what exactly was happening on that empty side of the river. The horizon may only show farmlands and emptiness but there was definitely a lot activity still in the Huangpu River area. Another noticeable change on the map is near Renmin (or People’s) Square. If you look closely, you can see People’s Square still maintains its shape from when it was a pre-communist era horse racing track. It appears that when China was its most communist, the area surrounding the square was a parade area to likely show off military hardware and strength. However, that area has since evolved into Shanghai Museum and the Urban Planning Exhibition. If you want to wander around the entire map on your own, you can view or download the full-res map here. John is a Technical Success Manager at WP Engine. Before moving to Austin, John lived in South Korea and China for the better part of four years. His life as an amateur Chinese web censorship expert, traveler, map nerd and beer geek can be found on this site.